I love you. You know that. In fact one of you, and I won’t name names, is already over that game I play where I say, “Hey, I have to tell you a secret,” and then you come over and I whisper “I love you so much” in your ear. You can deny it, but your eye roll says it all. Regardless, I will continue to tell you how much I love you a gazillion times a day. This will never get old to me. Never. And one day, if you have kids, you will do the same. I can promise you that. But I digress. Back to the topic. We need to have a serious chat about something. I love you. (See, there I go again.) And that means all of you. Including everything you create with those perfect (although usually extremely dirty) little hands of yours. But you all really need to slow your roll on the amount of artwork you create. And I use the term artwork loosely to include your drawings and paintings, any craft projects you make, those pages you’ve ripped out of activity books to color and adorn with stickers, the random Post-Its and scraps of paper I find all over the house with cryptic writing and various symbols drawn on them, and anything covered in doodles. Oh, and those pieces of paper that look completely blank at first glance but really have a few teeny tiny lines or dots or squigglies on them so that they cannot be used in the printer. Hopefully you get the point. But why, you ask? Well, because we just don’t have the refrigerator space, or wall space, or cork board space, or desk space, or floor space, or shelf space, or closet space, or drawer space, or filing cabinet space, or car space, or purse space, or diaper bag space, or under-the-bed space, or under-the-couch space…to showcase every blessed piece of your artwork. Plus, and I know this is going to sound very harsh, but it’s true–not every single thing you draw is a keeper. I refer you back to those papers with two barely visible markings on them. Or the colorful, glittery scraps not even you care to keep track of (and that I’m constantly getting stuck to the bottom of my feet). And while I’m sharing secrets, your drawings the other day didn’t accidentally fall into the trash can. (Read “recycle bin” if that makes you feel better.) Mommy put them there. On purpose. (Although apparently I didn’t bury them deep enough.) Because Mommy and Daddy’s most-used filing cabinet is, I’m sorry to say, our trash can. Now, don’t wrinkle your noses up at me. You’re going to thank me one day for this. Honest to God. How do I know? Well, first, I can promise that you won’t want to be strapped with the mortgage payments we’d be ready to hand over for the house(s) we’d need to buy for the sole purposes of storing all of your art. And second, when you’re older, you will have no idea what to do with the 83 gazillion boxes of old artwork that we’d be pushing on you the second you have your own place. How do I know this? Well, when I was little, Gramma kept pretty much everything I made and saved it all in boxes. And when I got older she’d plea with me to take all of the stuff she had saved because it was taking up too much room. You know why it was taking up too much room? Because there was too-damned-much stuff in there, that’s why. Sure, I’ll admit that it was kinda fun going through things and seeing how extremely talented I was from a very young age. (Ahem.) But after that, I had no idea what to do with the boxes and boxes of discolored papers that smelled like they had been sitting in a basement for 20+ years. But hows about we make a pact moving forward for all the rest? I know it upsets you to think about me throwing away all of your hard work. So, I promise I won’t throw things away willy nilly anymore (because I have to admit, I did feel a little bad when you found that stuff in the trash). If there are things you want to keep, we can. We can use the old standby refrigerator display method, or we can hop on Pinterest to find some creative display ideas. Like this, or this, or even this. We can do a weekly rotation (although if I’m being realistic, let’s say monthly; ok, fine, twice a year), and then we can re-evaluate. If you still want to save something once its display time has elapsed, let’s save it in a photo. I can take pictures and we can save them on my computer or on a CD or thumb drive. Or heck, even on our “cloud.” Then we can throw away/recycle the actual art. This has the twofold benefit of 1) saving space (in our house, anyway, oh and in yours in the future) and 2) keeping a record of your art that doesn’t yellow or take on that musty basement smell over time. Then, if you want to get crafty and creative with the pictures down the road, do it! It’ll mean you’ve activated some lazy recessive gene of mine that until this point in my life has remained pretty dormant. Looking forward to all of your future masterpieces. Just don’t expect me to save them all. 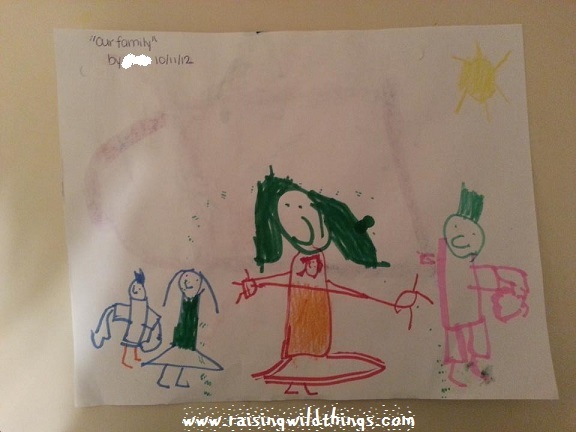 Categories: My Parenting "Expertise" | Permalink. Thanks for making me laugh today.. the pic of the baby on your chest gave me quite the giggle. Smart to take a pic of the pic! I feel like I’m a recovering hoarder; always trying to break the “keep every single thing” habit. I never got the “keep every single thing” gene from my mom, but I totally get it. The photo idea is great. When our kids made “projects”, I would take their picture holding the project and date it with a description of what it was for. They each had their own little scrapbooks of these photos. Our youngest turned out to be an artist and we gave him a huge folder to store some of his “keepers”. And our daughter did a few really good drawings in high school that we framed and hung in her room. They now hang in her baby daughter’s room. I REALLY like the idea of taking photos with them holding their creations. And how cool that some of your daughter’s art now hangs in her baby’s room? That’s awesome. Love!!! I like the photo idea. We keep a portfolio and place it between the matress of each kid to keep it flat. It works! I think your honesty is refreshing! I was just watching an episode of The Middle and the youngest kid was so ticked off, because there were none of his art pieces in the house. And the Mom tried to pass off a piece from their perfect neighbor who kept every piece big tubs, labeled in the garage. I think what you’re suggesting is the happy medium. Hi! My kid hasn’t reached this stage yet, but I know I will have a tough time throwing out his artwork too. That’s when I’ll think of this! It’s hard, but you gotta do what you gotta do. Good luck!